Fame has a peculiar way of reducing an individual to a couple of arbitrary acts. Ira Hayes, the Pima Indian and World War II Marine, was given his slot in the historical record for two things: he helped raise the flag at Iwo Jima and died an alcoholic  both of which were widely chronicled in the media and in a song by Johnny Cash. This past fall, the complete story of Hayes's life was laid bare in Clint Eastwood's epic film Flags of Our Fathers, coming out on DVD. 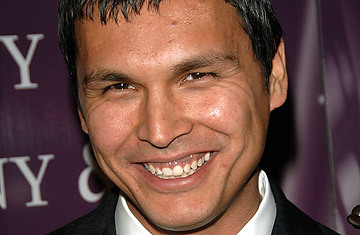 Cast as Hayes was Adam Beach, whose stirring portrayal of a man confronting his psychological demons, earned him praise from critics around the world. This isn't the first time that Beach, 34, has drawn attention for a strong performance. The actor, a Salteaux Indian from Manitoba, has more than two dozen films to his credit, including the critically acclaimed Smoke Signals and the John Woo-directed Windtalkers, where he starred opposite Nicolas Cage. He chatted with TIME's Carolina A. Miranda about war, the state of Native actors in Hollywood and the comic book superhero he would one day like to portray. TIME: In Flags of Our Fathers, the young servicemen depicted in the famous flag-raising photograph are sent on a bond tour to drum up money and popularity for the war. It's a pretty unsavory look at how the war was sold to the American public. Do you see a parallel to any modern-day wars here? Beach: When it comes to war, there's always a propaganda effort to influence everybody so that they say, "Yay! It's good." Eastwood's interpretation was, I think, to get a stronger perspective on the battle of Iwo Jima. It was one of the bloodiest and most important battles of the war. A lot of people  especially our younger generation  are forgetting the veterans who fought in that era. The soldiers going into that battle knew that they were in trouble, but it didn't stop them. They had a job to do. We have to respect them for giving up their lives that way. How did you prepare for the role of Ira Hayes? I have a cousin who is a spiritual advisor for Native veterans in Canada so I'm very familiar with the history of Natives in the military. And growing up as an American Indian myself, the story of Ira Hayes is one that is often told. For me, the role was really about preparing emotionally. I just sunk myself deep into the horrors of war. I walked around thinking about it every day. So many of the soldiers were so young. A lot of them were 15 and 16. After a couple of weeks of focusing on that that, you find yourself so heavy. Were you in touch with the Hayes family prior to filming? No. I just didn't want to get distracted. I wanted to make this personal. I wanted to feel like I was Ira Hayes, but I had my own interpretation of what that was. I read that you hosted a screening for his family in Scottsdale after the movie was completed. What was that experience like? The screening was a mix of emotions. Ira's niece told me, "Now I know what Ira must have felt and why he didn't talk a lot." It was really emotional for the whole family because I don't think any of them really understood the specifics of what he went through. I don't think he told anybody about it. A lot of those veterans didn't talk about it. This film brings you to understand an epic battle, but it also shows how emotions are played out when it comes to war. How important was this role to you? For me, it was an ultimate achievement. Look at the history of Native American people in Hollywood: they have not been represented in a human way on film. I didn't want this role to be about stereotypes. Ira Hayes has been played before as this raging alcoholic who is angry at the world. But he's not. He's very proud. When he drank, it was just his way of coping. That's how a lot of veterans coped with their emotions. This isn't a one-dimensional only-Indians-drink-alcohol portrayal. He was a person fighting a battle. Here, we got to see his full range of human qualities. This film gave him his spirit back. Why do you think that Hayes was so haunted by what happened? Was it that he had survived one struggle and came home to face another? For Hayes, there was obviously a struggle to maintain his identity and fight against racism. A lot of people, when they ask me about the film, say, "Oh my god, I can't believe they didn't let him drink in that bar and they kept calling him 'Chief.' That's so racist." I tell people, hey, this is reality. I grew up in those conditions. When I was growing up, my white friends would call me: "Hey, Chief!" Even when I go to work now, people call me "Chief." Do people on movie sets really call you "Chief?" Of course! People think they have the right to use that term with an Indian person. I don't get upset because I know they don't know any better. It's how people acknowledge Indians. Hollywood has portrayed such a negative image of who we are as people up on screen. They don't realize that there is a culture. There's another part of us that exists. As you just mentioned earlier, Ira Hayes has been portrayed on film several times: first by Lee Marvin in an NBC television special in 1960 and then by Tony Curtis in The Outsider. Why do you think it took Hollywood so long to cast an Indian in the role? I don't have an answer for why Hollywood still casts non-ethnic people for ethnic roles. It's something that has to change. Sometimes they'll write a character for a Native person and then say, "Well, there's no Native actors that can capture the intensity of this character, so let's just make it a white person." I've seen it time and time again. I also think that people in Hollywood don't believe that a Native or an ethnic person can be a draw and make money. There's so much politics involved. Your childhood has been widely documented as having been very difficult: you were orphaned at the age of eight and, later, as a teenager, you were into gangs. How has acting been a release from that? Acting has made me embrace my childhood. It's become some weird form of therapy. It's like I have a place where I can release all of these emotions. When I was playing Ira Hayes, I didn't have to think about the death of my parents directly. It's just there. I can blend it into Ira's character. I can use Ira's emotions as an outlet. I can draw on this and say, "How does Ira feel about the death of his friends?" My body is not afraid to release that. In a profile of you, the Times of London wrote that in portraying Ira Hayes, you were "carrying the expectations of the Native American community on [your] shoulders." Is that so? And if so, is it fair? I do acknowledge my status as a role model for Native American people. I carry it on my sleeve. I do want a younger generation to look at me and say, "Wow, what did he do to achieve such status in Hollywood?" I want Native children to have success within their hopes and dreams. The history of Native American people is tragedy. I want to show that we as Native people are successful. We do have things to offer to the world. So what's the next Adam Beach dream role? I'm still trying to figure out how to get this comic book hero off the ground: Turok. He's the dinosaur hunter. It's also a video game right now. I'd love to do the voice in the animated version. But I want to do a live action version as well. Also, I just officially signed on with Law & Order: SVU. I'm the new regular. I'm stepping into one of the hottest shows as a regular. It's history in the making: there will be a Native American individual who will be shown nationwide on television once a week. Native people will be able to look at TV and see themselves. That for me is a dream role, too.